I was given this plant last July (2018). It came with a small trellis and the plant has grown around the trellis. I would like to, and probably need to, increase the height of the trellis but I'm not sure of the proper way to do so. 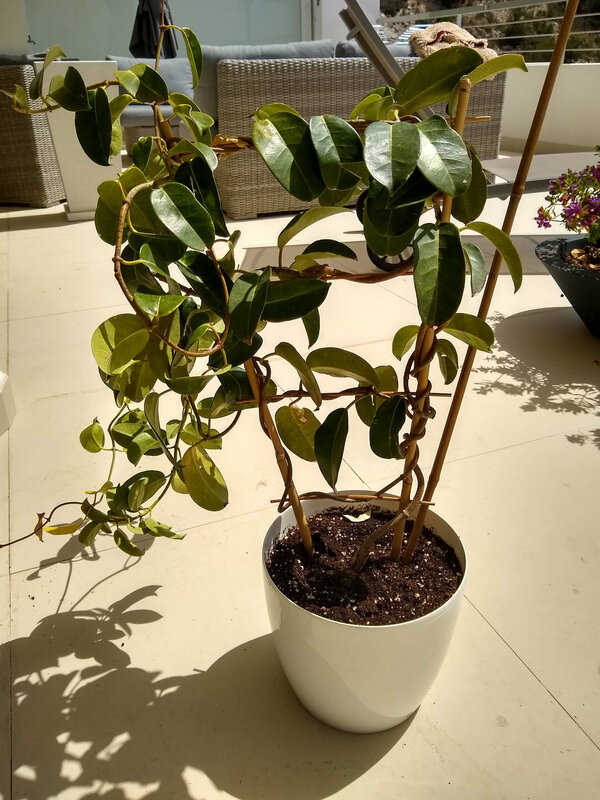 Also, I live in Spain just north of Alicante and would appreciate any other advice as to taking care of this plant. Please advise and thanks. See attached photo. This is a duplicated question and has been answered elsewhere. If you want the best out of your Stephanotis, I'd suggest you increase the size of your container. They are quite large greedy plants, will require some shade from the extremes of your Spanish sun. I found mine flowered happily planted in a bed in a west facing conservatory in Almeria.